This Miso-Tahini Kimchi bowl is my favorite type of meal, because you can make a big batch at the beginning of the week and then every day after you can have dinner on the table in less then 5 minutes. If you're the sort of person who doesn't like to eat the same thing everyday, then a simple solution is to make more than 1 sauce (check out the links below) and have a few other vegetables and beans on hand to vary your meals if you like. For example, you could have a stir fry with peanut sauce one night, tofu kale with garlic tahini another night, and then this miso kimchi bowl a third night—similar ingredients but different styles! 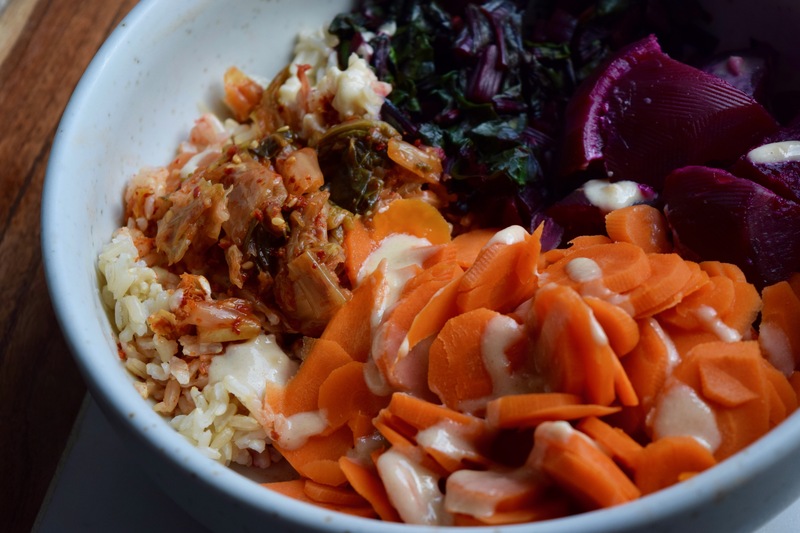 You could also eat this kimchi bowl every other night and have sandwiches or pasta in between. The kitchen tools I use to make this magic happen include a crock pot to boil the beets for several hours, a food processor to chop my carrots (once peeled), a rice cooker for the brown basmati rice and the steamer tray for steaming the chopped carrots while the brown rice cooks, and then when the food is all ready I just water-sauté the beet greens with minced garlic and braggs liquid aminos (or low-sodium soy sauce) for a few minutes in a frying pan. Preparing food this way makes it relatively hands off, which I like. Let's do this miso thing! Pour 3 cups water, brown rice, and 1/2 teaspoon salt into rice cooker and turn on. This should take about 45-80 minutes (depending on your machine). Hassle free is my favorite. If cooking over the stove, bring 3 cups water and 1/2 teaspoon salt to a boil over high heat in a medium sized saucepan (use a lid to speed up the boiling process). When water is boiling add brown rice. Lower heat and cook, covered, for 15 minutes. Turn heat down to the lowest setting. Cover and cook for 15 additional minutes. Turn off heat and let stand, covered, for 5 minutes. If any liquid remains in the bottom of the pan or if the brown rice is still a bit crunchy, return the pot to low heat and cook, covered, for an additional 5 minutes, until all the water has been absorbed. Set aside. Scrub and trim beets, leaving about one inch of the tops and stems on (this prevents the red color from seeping into the water and getting all over the place). Put the beets in a crock pot, fill with enough water to cover the beets, put lid onto the crock pot, and cook on HIGH for 3 to 4 hours, or until the beets are tender. If using the stove top then place beets in a saucepan covered with water and bring to a boil. Boil 30-60 minutes (depending on the size of the beets) until tender. Remove from liquid and allow to cool. When cool enough to handle, trim ends and slip the skins off. Slice into small chunks and set aside. Wash, peel, and chop carrots into bite sized pieces (if you have the slicing attachment for a food processor then this will only take about 20 seconds). The best way to steam the carrots is in a rice cooker while your brown rice is cooking (if you are using a rice cooker and it has a steamer tray). If you do not have a rice cooker then use the stove. In a large heavy frying pan (or saucepan) heat ½ cup water and bring to a simmer. Add carrots and steam for about 3 to 5 minutes until soft, set aside. Wash, de-stem, and chop beet greens into bite size pieces. Slice the stems into tiny pieces as well. Peel and mince garlic. In a large heavy pan bring ½ cup water to a boil. Add sliced beet stems and minced garlic. Once water is boiling cook the stems for 3 minutes and then add the chopped beet green leaves and reduce heat to medium-low cooking for 3-5 additional minutes. Add liquid aminos and stir to combine. Continue to stir occasionally until beet greens are soft and water has mostly evaporated. Remove from heat and set aside. In a bowl scoop 1 cup cooked brown rice and top it with 3/4 cup chopped beets, 3/4 cup chopped carrots, and 1/2 cup beet greens. Garnish with 1/4 cup kimchi and 1 tablespoon miso tahini sauce. BTW – I LOVE Korean food and there is nothing better on this earth than cooking an asian sweet potato (yellow flesh), wrapping a paper towel around it, then peeling as you eat it, a piece of kimchi on top with each bite. I can totally see myself adapting this recipe to use asian sweet potato! Thank you! 😉 I was really excited about how good the food tasted and how well the pictures turned out!